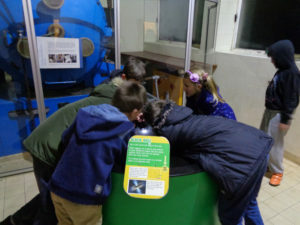 Shortly before sunset, on Thursday 16 February, forty nine parents and children, together with five volunteers, set off from Hollingdean to visit the Observatory and Science Centre at Herstmonceux (to know more about this fantastic place please click here). Although it was cloudy, and had been cloudy all week, the weather forecast gave some hope that there would be breaks in the cloud cover during the evening. Due to the heavy traffic it was already dark by the time we reached Herstmonceux village. But we still had a few miles to go down murky narrow country lanes, before we reached the Observatory. There was some excitement when the Observatory’s Domes were eventually spotted looming in the dark over the hedge rows. On reaching the Observatory, we were greeted by Jo the Duty manager and John, the resident astronomer for the night. Once let loose, the children soon spread out to explore the Science Centre’s hundred or more interactive astronomical and science exhibits. 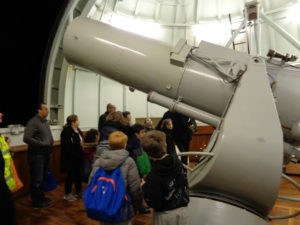 Meanwhile, when there were sufficient long breaks in the cloud cover, John took small groups of parents and children up to Dome A, where the Thompson 30-inch Reflector telescope is housed, to see Venus still high in the western sky. He told each group all about the telescope. 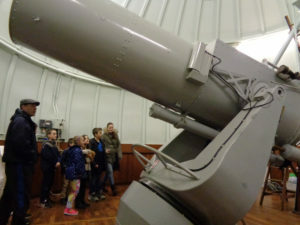 He told us that, at the time it was originally presented to the Royal Observatory in 1896, it was the largest telescope of its type in the world. He described how it had been used to observe comets, asteroids, moons and planets, and the discoveries that had been made using it – the most notable being the discovery of the 8th moon of Jupiter. 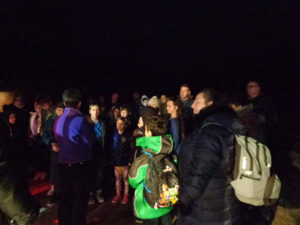 Groups of children were able to see Venus through the telescope, where it appeared as a sharp moon-like crescent. John explained how Venus was Earth’s neighbour and twin in terms of size, but inhospitable due to the hellishly hot temperatures on its surface caused thick clouds of carbon dioxide and other greenhouse gases in its atmosphere. And why, because of its closed orbit to the Sun compared with that of the Earth, it appears to have phases like the moon. Once Venus has sunk too low in the sky to be seen, we all had hot soup in the Science Centre’s canteen. 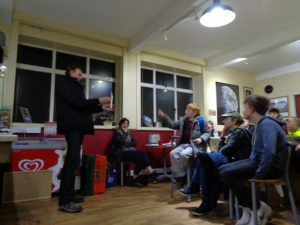 After which John gave an enthusiastic talk about astronomy. This was wide ranging including: the nature of light, the apparent motions of the stars and planets, and the discovery of planets orbiting other stars. He also entertainingly explained what black holes were, and how stars, including our own Sun, would eventually expand and explode. John’s talk brought forth a host of questions from his attentive audience. These ranged from: had it been possible to see Father Christmas though the telescope at Christmas Eve, from one of the youngest present; why it was not possible to see the dark side of the Moon from the Earth; why had Pluto been ‘demoted’ in status to being a mere dwarf planet; through to how all the natural elements found on Earth had been forged in the explosions of older generations of stars. After the talk there was time for one last chance to have a go on the exhibits before it was time to go home. We arrived back in Hollingdean at 10.30 pm all well and truly tired, but it was half term and there was no school in the morning!